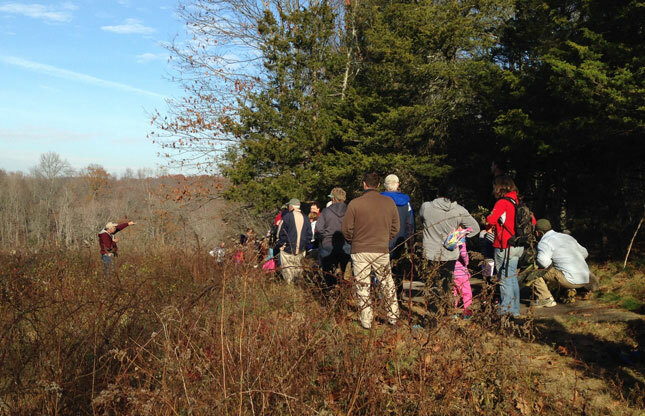 The Branford Land Trust’s NATURE EXPLORER PROGRAM is pleased to offer our Annual Pre-Thanksgiving Walk at the Van Wie Preserve, led by Bill Horne and Matt Reed on Sunday, November 22 at 1:00 PM. This is a great opportunity to enjoy the outdoors and the refreshing fall weather! Meet at the trailhead at 87 Red Hill Road. Directions: From Exit 56 on I-95, go south on Leetes Island Rd. for 0.1 mile, and turn left (east) onto Red Hill Rd. Proceed to #87, which is on the right, and park on the right side of the road. For more information call 203-415-1571. All events are free and open to the public.